Relax and get better sleep with TaoMix 2. Let yourself be lulled by relaxing and immersive soundscapes inspired by nature. Customize your creations and share them with friends and family! Download TaoMix 2 now and enter an infinite world of sounds. 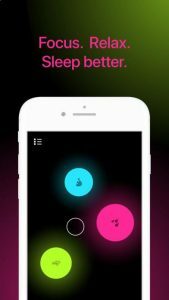 TaoMix 2 offers a unique and easy way to create your own relaxing soundscapes that can evolve randomly over time, for a perfect immersion. 1. Add relaxing sounds to your soundscape. Select from the wide range of high quality sounds or record your own. You can add as many sounds as you want, they will be represented by coloured disks. Move the coloured disks and the white cursor around : the closer a sound is to the cursor, the louder it plays. Lose yourself in nature’s marvellous song, and let it guide you at its own pace. Easily create unique soundscapes that evolve over time. Collect and mix more than 120 carefully handpicked sounds. Record and import your own sounds. Possibilities are endless! Use the timer to fall asleep or to set a time limit to your relaxation, meditation or yoga sessions. HomeKit: Pair your smart lighting system and experience ultimate relaxation! Option to generate random soundscapes. Save, rename and organize your creations. Share your creations with your friends via Facebook, Twitter or by email. Control the app with any AirPlay device! We’ll continue to grow the sound collection, so please send us your suggestions! We are a team of two developers based in Montreal, Canada. TaoMix 2 is the sequel to our first app, TaoMix, and its design was largely guided by your constructive feedback and encouragement.